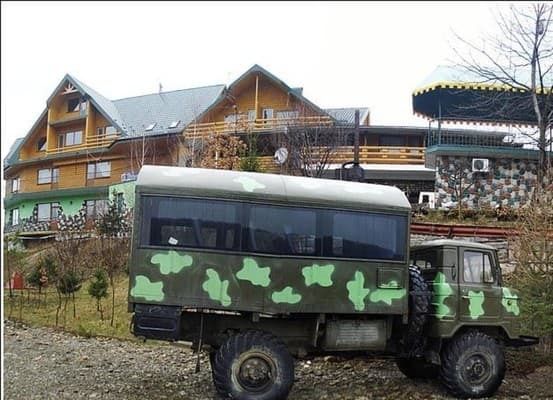 The hotel complex "Bystrica" ​​is located in the village of Rakovets, from the village of Bogorodychany and the nearest ski lift in the village. Guta is 18 km away. To the hotel there is an asphalted convenient access. There are 15 rooms in this hotel, as well as a sauna, a shop, a hairdresser, a restaurant, a conference room. The complex "Bystrica" ​​is equipped with a summer area, a territory equipped. Water autonomous heating. Round the clock cold and hot water. Rooms of three categories - poles, suites and apartments. For an additional fee, you can book a transfer, a sauna and a conference room. From the entertainment in the hotel: bike rental, table tennis, billiards. Excursions, hiking, horseback riding, hunting, fishing. Meals are served in the restaurant. There is parking and luggage storage. You can use a brazier and iron. Also on the territory of the complex there is a farm yard. Payment depends on the season. In the restaurant according to the menu. The hotel complex "Bystrica" ​​is located in the village of Rakovets, 18 km from the village of Bogorodychany and the nearest ski lift in the village. Guta. By public transport: from Ivano-Frankivsk from the knitting factory by shuttle bus to Iv.Frankovsk-Guta. By car: from Ivano-Frankivsk to Bogorodchany (route H-09), after Bogorodchany turn following the sign "Guta". Drive about 18 km to the village. Rakovets, the hotel is to the left of the road.